Left to right: Dr. Ben Gutierrez, Liberty University administrative dean for undergraduate programs; Dr. W. Douglas Crawley, associate dean for the Center for Music & Worship; Dr. Kevin Corsini, administrative dean of graduate programs; Dr. Vernon Whaley, dean of the School of Music; Dr. Ron Hawkins, vice president for Academic Affairs and vice provost; President Jerry Falwell; Dr. John Hugo, Chair of the Department of Music; Bobby Moon, president, Construction Management Associates; Charles Spence, director of Planning & Construction; Dr. John D. Kinchen, associate dean for the Center for Music & the Performing Arts; and Phil Kirby, vice president, Construction Management Associates. 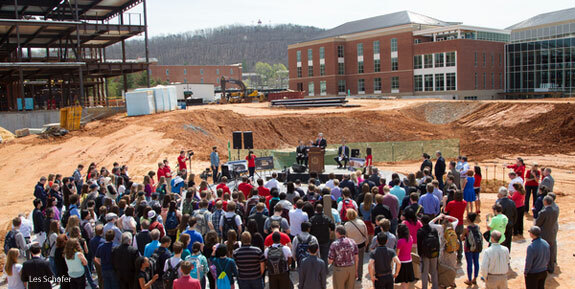 With the sun shining bright overhead, members of Liberty University’s administration joined faculty, staff, and students of the School of Music to celebrate the groundbreaking of the new Center for Music & the Worship Arts on Friday, April 11. 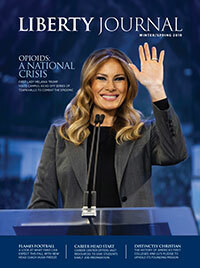 The site is located on Liberty’s main academic corridor, near the new Jerry Falwell Library and the Science Hall, currently under construction. The 144,000-square-foot, state-of-the-art structure is part of Liberty's $500 million campus rebuilding phase. The building will feature a 1,600-seat fine arts auditorium; 50 practice rooms; 40 teaching studios and piano, songwriting, and music computer labs; as well as two student recital halls/classrooms. The educational wing of the building is scheduled to be completed by Fall 2015 and the auditorium is scheduled to open later that semester. Dr. Vernon Whaley, dean of the School of Music, led the crowd in an opening prayer. Dr. Ron Hawkins, vice president for Academic Affairs and vice provost, spoke about the history of forming the School of Music, which became the seventh largest school of music in the country when the Center for Worship and the Music and Humanities department merged in 2012. 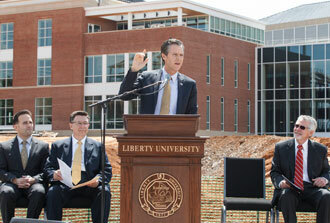 With the new library as a backdrop, President Jerry Falwell speaks at the groundbreaking ceremony. President Jerry Falwell addressed the crowd, crediting the staff with their hard work to complete the plans for a world-class facility that will greatly enhance the school’s offerings. He said that as students are being equipped to do this, they will celebrate God’s greatness, goodness, and glory. 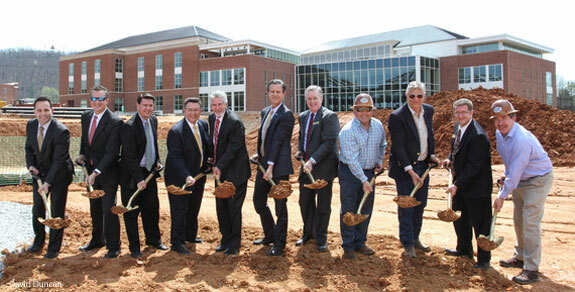 Whaley joined President Falwell, School of Music leaders, and members of Construction Management Associates on the ceremonial shovel line. Dr. Ben Gutierrez, administrative dean for undergraduate programs, closed the ceremony in prayer, asking God to bless the School of Music as its students and faculty proclaim His message of love and salvation.